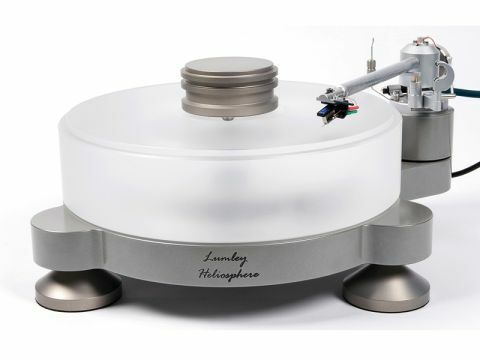 The similarities between the Heliosphere and Stratosphere are few, as you might expect from the price difference, but they both have a triangular-shaped plinth and support their tonearms on a cylindrical base. The £2,495 Heliosphere is distinguished by an unusually chunky acetal platter – 74mm-thick – a size that you might be able to associate with the more expensive Clearaudio designs, but one that's rarely seen with any regularity. One aesthetic advantage that the substantial depth of the platter confers is that it allows the drive system to be hidden, despite the fact that this is a largely skeletal design. When it was first set up we assumed the motor would be free-standing and drive the periphery of the platter. But you have to lift the 6.3kg slab of acetal to see what makes the thing go round. The plinth itself is aluminium, a fact that the painted finish tends to hide. In fact, the finish is very good, but an anodised silver or black would have been nicer. It's something that would, however, have impacted on price which Metropolis was keen to make competitive, a job it seems to have had some success with. The plinth sits on large inverted cone feet that are free standing and have to be carefully positioned so as to intersect with the nylon inserts on the underside of the plinth. This is a tricky job because you have to guess where to position the cones and then align them properly without scratching the underside of the plinth. There is little to stop energy travelling up through the turntable and into the platter, so this is one of those record players that like many others should be carefully supported away from loudspeakers. Energy excited in the vinyl by the stylus is partially damped by a large aluminium clamp that uses gravity alone to keep the record flat. This makes for quick disc-changing, but is not as effective as a threaded design in pinning down less than flat LPs. Our sample came equipped with a Clearaudio Unify tonearm (£1,400) and a Sumiko Blue Point Special Evo III high-output moving coil cartridge (£220), both components selected for value for money. A state of affairs somewhat undermined by the value of the pound which has meant that the tonearm has risen in price by £500 since it was originally selected for the turntable. The Unify is a very well put-together arm with a carbon fibre arm tube, sapphire unipivot bearing and an eccentric counterweight. The latter can be twisted on the stub in order to make the cartridge body/stylus sit upright in the groove (azimuth). VTA can be adjusted with two grub screws in the collar and the arm wires exit at the top of the arm and go to a connection point with the tonearm cable proper, there is said to be no break in the actual wire itself. The BPS Evo III is the current version of a classic budget cartridge, it's a moving coil, but has the output characteristics of an MM design. Output is 2.5mV and its preferred input impedance is 47kohms, which means that it works with MM inputs. This turntable would benefit from something more aspirational, but the BPS does not seem to stand in its way. Give it a well-isolated support and the Heliosphere delivers an entertaining result with the arm and cartridge supplied. You can hear the large slab of acetal in a slight midrange coloration that accentuates instruments like pianos and brass, but given how much of the stuff there is, it's well controlled and does not get in the way of the musical message. Thanks to a good sense of timing the Heliosphere is a fine communicator that quickly wraps you up in the groove, especially if its one that has been created by a musician like Keith Jarrett and his cohorts. His album Changes retains all of its nimble and beguiling rhythmic subtleties in the context of good three-dimensional imaging. The double bass, in particular, seems to come out best in this respect, something that suggests a slight emphasis on the upper bass perhaps. Energy is never in short supply, especially when you play some Muddy Waters, his I'm Ready album positively bursting with the stuff on this turntable. At one point we forgot to put the big clamp on and were gratified to hear the increase in solidity that bringing it back in made. But stare at the rubber feet for too long and they appear to go backwards, so best close your eyes and let the music transport you. Despite its extra motor this is an appealingly quiet turntable, it won't suppress the shortcomings of the vinyl, but that's more a reflection of the cartridge we suspect, it's more that the noise floor is nice and low so that quieter musical elements are easy to follow. Steel guitar strings have a little more zing than usual but this just gives a sense of crispness that's really quite appealing with a good record such as John Fahey Visits Washington DC. You can fully appreciate the attack of the picked strings, but that does not mask the decay of the notes, thanks to a cohesive and tidy presentation. The Sumiko BPS III is a remarkable cartridge for the price. You can hear its limitations on more sumptuous recordings like Rickie Lee Jones' Flying Cowboys, where the polish is not quite as high as it could be, but there's plenty of it, nonetheless. More importantly, the turntable reveals the hand of producer Walter Becker (Steely Dan) rather more clearly than usual, the recording's sound being highly reminiscent of the last decent 'Dan album Gaucho. Surmounting the production, of course, is the material – this is superbly played and thanks to Ms Jones' delivery, emotionally charged to a degree that you don't expect of something so slick. Jeff Buckley's Mojo Pin delivers a wealth of detail in the Heliosphere's arms, a dynamic recording for its type, it combines quiet and intense sections, both of which are well served. Less sophisticated records also fair well, frank Zappa's 1969 album Hot Rats is not the slickest-sounding record, but it's got plenty going on in tracks like Peaches En Regalia. This has remarkably cheesy organ and grungy guitar, but there is plenty of body to the sound and no shortage of energy. The turntable also digs out the bass pedals to trouser flapping effect which is most gratifying, it probably helps to have big active ATC speakers to appreciate this but it's not essential. The following track, Willie the Pimp, has a pulsating groove and the distinctive vocals of Don van Vliet (AKA captain Beefheart), a contribution that in these circumstances makes it all the more difficult to get on with the reviewing job in hand. While the experienced ear can detect the character of the platter material on the Heliosphere, its effects are like those of a valve amplifier, largely euphonic. This is not the most neutral turntable, but neither is it obviously coloured, it has wide bandwidth, good dynamics and great timing and these are the key factors one wants from a record player. We found the Heliosphere both highly entertaining and engaging and considering the great build quality and tidy design, it's hard for us not to recommend it.